There’s nothing more exciting than discovering new makeup and beauty products that are amazing quality, but also budget-friendly. Whether you’re just starting out with makeup, trying to stick to a beauty budget, or simply prefer not to spend a lot on makeup, here are 14 beauty finds that you can pick up for less than $10 at your local drugstore! Essie 2015 Resort Fling Resort Collection Nail Color (in Suite Retreat) • $8.50 – These are very pigmented nail polishes (2 coats is all you need), with a huge selection of shades available. NYX Cosmetics Powder Blush (in Mocha) • $5 – My favorite drugstore blush! They’re long lasting, pigmented, and very blendable! E.l.f. Moisturizing Lipstick • $4 – This lipstick is sooo creamy and moisturizing, plus there are plenty of shade options. NYX Cosmetics Simply Vamp Lip Cream (in She Devil) • $9.95 – Another creamy lip color that comes in 6 darker shades that are perfect for Fall! E.l.f. Studio Blush Palette (in Light) • $6 – A versatile blush palette that’s great for experimenting (and travel!). NYX Cosmetics Jumbo Eye Pencil • $4.49 – Use these as an eyeshadow base, or just on their own! E.l.f. Essential Eyelid Primer (3 pack!) • $9.71 – A great dupe for the Urban Decay eyeshadow primer. E.l.f. Hydrating Face Primer • $6 – Love these for their super smooth (and quick) application. NYX Cosmetics Prismatic Eye Shadow • $6 – These eye shadows offer great pigmentation, plus extra dimension, and come in 10+ gorgeous shades. NYX Cosmetics Concealer Jar • $5 – Offers excellent coverage and pigmentation for the price! Boots No7 Stay Precise Liquid Eye Liner • $6.79 – A versatile liquid liner (so thin or thick!) that glides on smoothly and lasts all day. NYX Cosmetics Born to Glow Liquid Illuminator (in Sunbeam) • $6.65 – A shimmery highlighter – add a dab of this on the cheeks, nose, and forehead for a pretty glow. e.l.f. Contouring Blush and Bronzing Powder (in Turks and Caicos) • $6.04 – A nice two-in-one product with everything you need for color and extra definition. 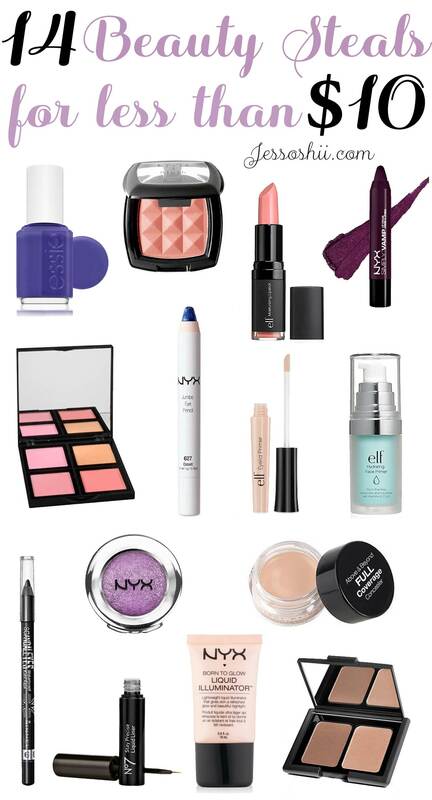 What are some of your favorite budget-friendly beauty buys?